Water spinach is a bit hard to find in North America so when I find one I try to make the best out of it. 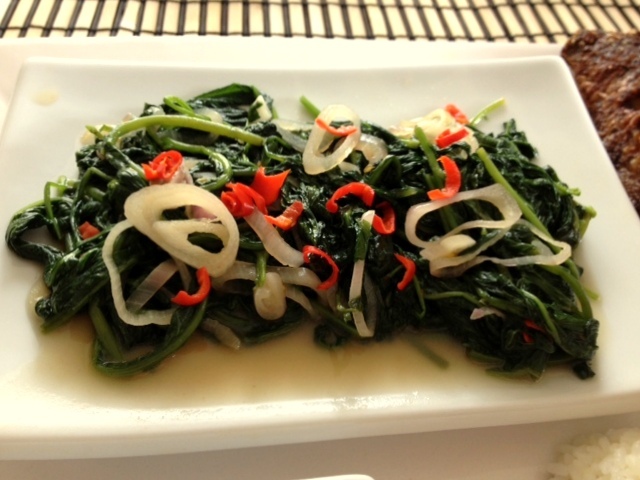 Good thing with this spinach, it doesn't take much to cook it into a nice simple dish. 3. Toss in the water spinach, Thai chilli and tomato, lower the heat and close the lid.Watch closely since water spinach tends to get cooked very fast. 4. Once the water spinach is cooked enough to your taste (in my case I like it a bit softened but not too mushy), turn off the heat and serve!